Philip Courtney Hunter was born in 1881 and at a young age displayed considerable talents and intelligence. 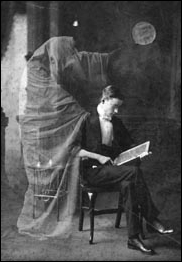 By the age of 20, Phil the Wizard, as he became known, was an accomplished magician who traveled throughout the country entertaining huge crowds at every stop. 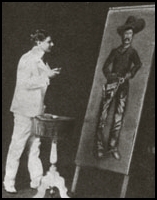 Dard Hunter joined his brother as the “chalk talker” and would entertain the crowd during breaks. 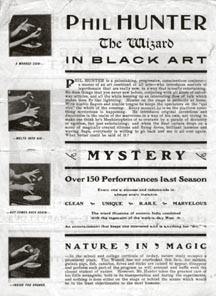 The act proved to be wildly successful and the two are reported to have made upwards of $2,000 a month in 1903. Phil was known not only for his great sense of humor but also for an eerie ability to predict his own future. In the third grade, he wrote in a school essay that he would be a successful magician, wear spectacles and die at a young age. 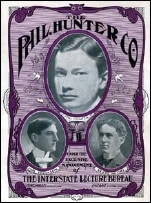 Sadly, he was correct and in 1908, Phil succumbed to complications from Tuberculosis and died at the young age of 27. To this day, Phil is known to prestidigitators across the nation as a true master of his craft.